Custom-cut gasket of plain (virgin), expanded or filled PTFE. • Gaskets for food, pharmaceutical and potable water applications are made from suitably approved Fluolion PTFE. 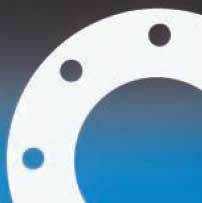 • Expanded PTFE gaskets are used on flanges that have rough or damaged faces. Also on glass, porcelain and plastic flanges where low bolt loads are essential. • Gaskets of filled-Fluolion are used for applications where the mechanical properties of PTFE need to be improved at the expense of chemical resistance and other inherent benefits. Chemical suitability See recommendations below. Fluolion PTFE: pure PTFE. Fluolion G15 & G25: contain 15% or 25% glass, by weight. Fluolion GS: 25% glass plus wear-resistant additives. Fluolion G15M: 15% glass and 5% molybdenum disulphide. Fluolion B60: 60% bronze. Fluolion GR: 25% carbon/graphite. Fluolion BR65: 60% bronze & 5% graphite. Precision cut gaskets to any shape, size or quantity. In sheets: 1.5m x 1.5m. Standard thicknesses: 1.0mm, 1.5mm, 2.0mm, 3.0mm.